It's been a lot of hard work and a journey of failures, learning, and success. 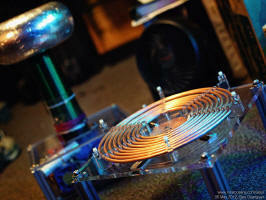 After several months of work, I will like to present my second Double Resonant Solid State Tesla Coil (DRSSTC 2). 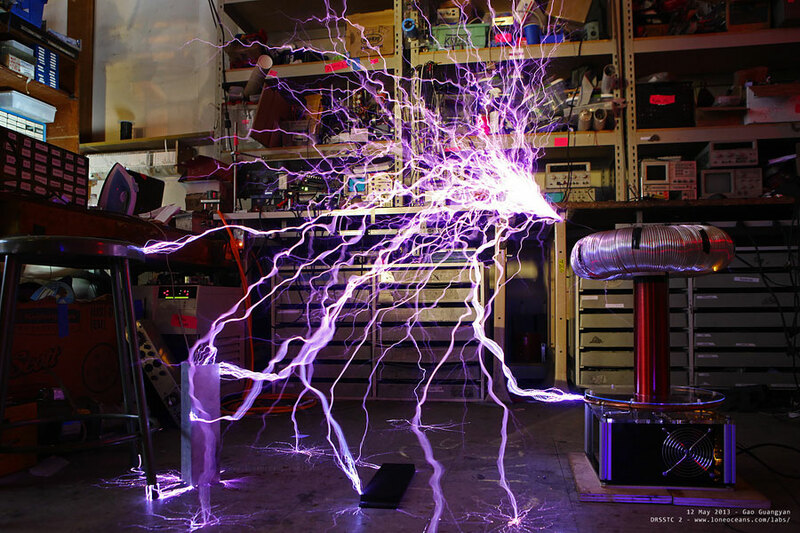 This project was born from a natural progression of my foray into Solid State Tesla Coils, beginning with my first SSTC1 in 2012. 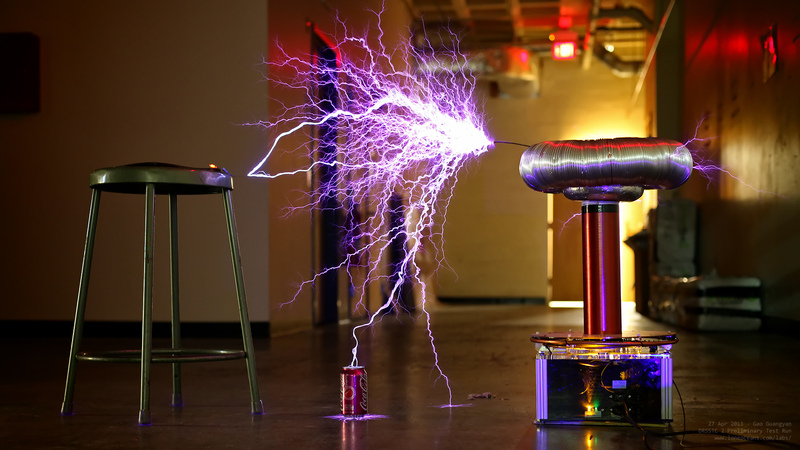 After that project, I built my first DR Tesla Coil variant, which was a small table-top DRSSTC 1 standing just about a foot tall in total, and capable of some two feet of sparks. With the development of a MIDI controller, I was also able to modulate the spark output and play music! After these two projects, I wanted to work on a much more powerful DRSSTC running as much power as I could, all within a small footprint. Thus DRSSTC 2 was created. 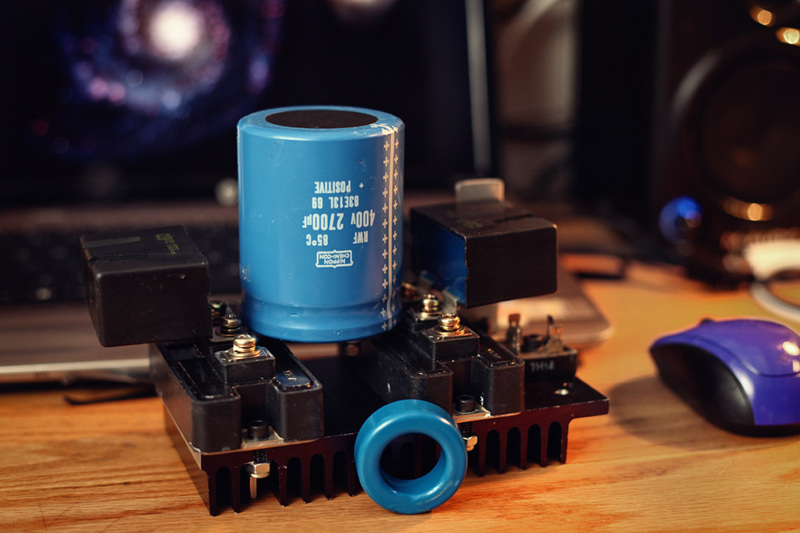 The DRSSTC was invented sometime around 2005, and differs from a traditional SSTC with the addition of a primary tank capacitor which cancels the impedance presented by the primary coil. The primary current flow is therefore much higher, placing greater stress on the switching transistors, but also allowing for greater performance. 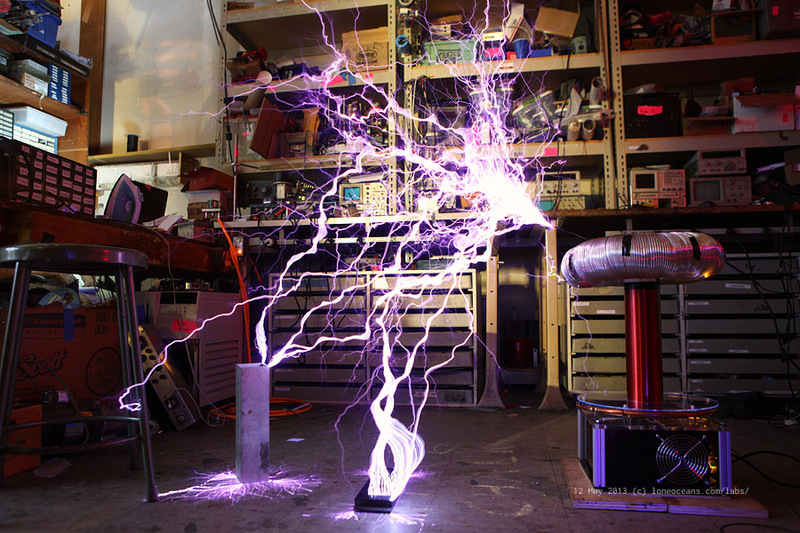 Regardless, this new breed of SSTCs still represents perhaps the most efficient of all Tesla Coils to date. DRSSTC 1 used a half-bridge of TO-247 package IGBTs, running no greater than 300A peak, with an average power draw of around 200W+ depending on the pulse width and frequency. I happened to have some large CM200/400 IGBTs around, and decided to take my DRSSTCs one step further, running at some 2000VA at 500A of primary current. 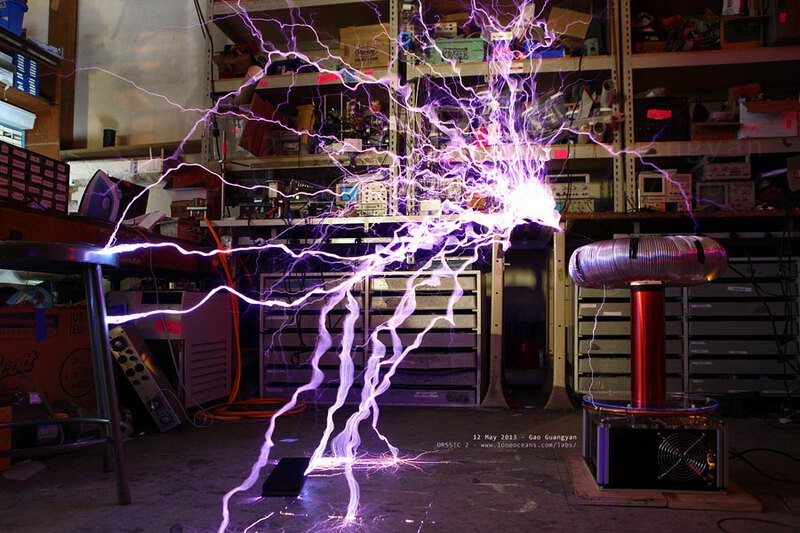 This page documents the design, construction, testing and results of DRSSTC 2 - my highest performing and most impressive Tesla Coil to date. This project was successfully completed in mid 2013 after about half a year of development, and I hope it will be a valuable resource for many coilers around the world. [Update: I've had many people from all around the world report replicating this coil with equal success! If this page was useful in your project, I'll be happy to share your project on this page as well! ] Enjoy and be safe! *note* I do not know of any other DRSSTCs built in Singapore by any fellow friends in Singapore. DRSSTC 2 may very will be the first of it's kind in my little sunny country! Thank you for visiting my page and if you have any questions, wish to share your projects, or feel that my projects have inspired you in one way or another, feel free to email me at loneoceans[at]gmail(dot)com. Having built my first DRSSTC 1 a few months ago, I decided to embark on a much more powerful and more impressive, yet still compact DRSSTC. I assume that the reader of this page has some familiarity with the general workings of a normal SSTC, and therefore won't go into much detail here. Check out my other pages for more descriptions on DRSSTC operation. A DRSSTC differs from a standard SSTC mostly due to an addition of a primary tank capacitor. 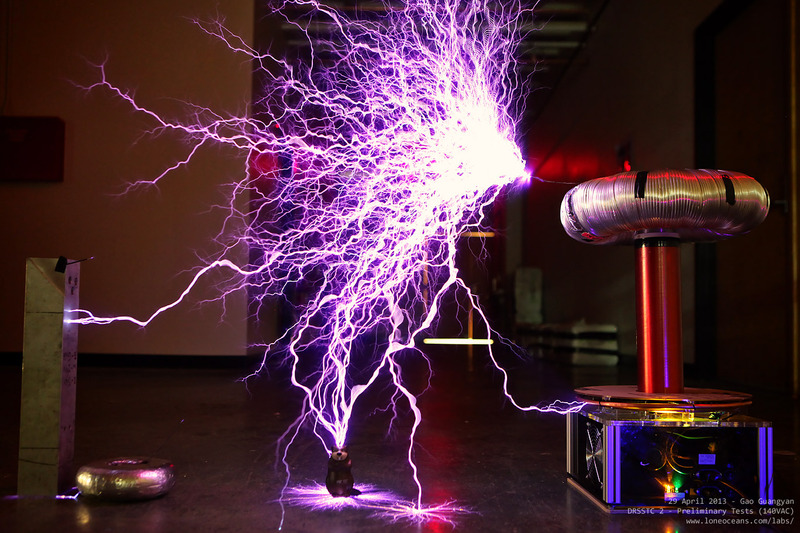 In a simplified explanation, the primary and secondary circuits are in tune - the capacitance due to the tank cap cancels the inductance from the primary coil, so we have no reactive component in the primary Tesla Coil circuit. Therefore, the primary current flow is limited only by the DC resistance of the primary coil, cabling and capacitors, and is therefore much higher than in SSTCs. My DRSSTC 1 runs on the order of 200-300Apk. In this design, I plan to run it at 500Apk with some 'brick-type' IGBTs. In addition, the primary current of a conventional SSTC is limited by streamer loading and primary reactance, allowing many variants to run in the Continuous Wave (CW) state. This is not possible for DRSSTCs, due to the huge current ring-up which would otherwise cause catastrophic failure in the switching transistors. Furthermore, the large currents flowing in the primary circuit can create voltages much higher than the supply voltage due to resonant voltage rise. Therefore, DRSSTCs run in the transient state, on the order of several tens to around three hundred micro-seconds per pulse, at several hundred pulses per second. Like my DRSSTC 1, this coil will also allow an optical interrupter input to control the pulse-width and frequency of the sparks. The interrupter sends a one bit signal (on or off), telling the bridge drive circuit to turn on for short periods of time (this is the pulse width). The coil is then shut-down for several milliseconds. This results in a reasonably low duty cycle, with a total power not exceeding 3kVA (designed). 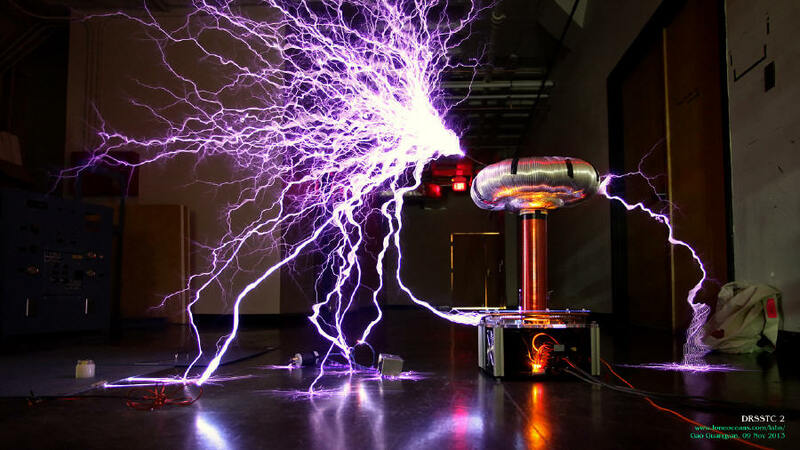 However, the instantaneous power of the coil during operation can be on the order of several hundred thousand Watts! In summary, the DRSSTC is actually a 'pulsed' device, operating at several hundred or thousand Hz (pulse repetition frequency or PRF), with each pulse lasting around 50 to 300us (pulse width), and closer to 50-100us for DRSSTC 2. Here is a basic description of what happens each pulse. 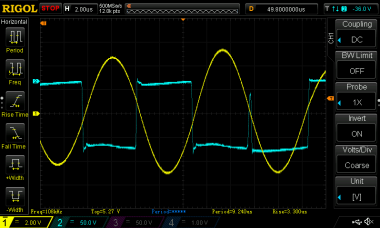 The goal for the primary drive: make a huge current sinusoid in the primary circuit. When the interrupter sends an on-signal to the driver circuit, the driver turns on the bridge (half or full bridge), which places the primary bus voltage across the primary coil and tank capacitor, like a 'step-input'. This causes the primary current to rise in a sinusoidal fashion at the primary resonant frequency. This current rises to a level determined by the surge impedance of the circuit, where impedance Z = Sqrt(L/C), and V = IZ. As the primary current goes down on the sinusoid and starts to flow the other way, we sense this with a primary current sensor, and turn the bridge the other way to add more energy into the tank circuit - a resonant drive. This is like pushing a swing at the resonant frequency. 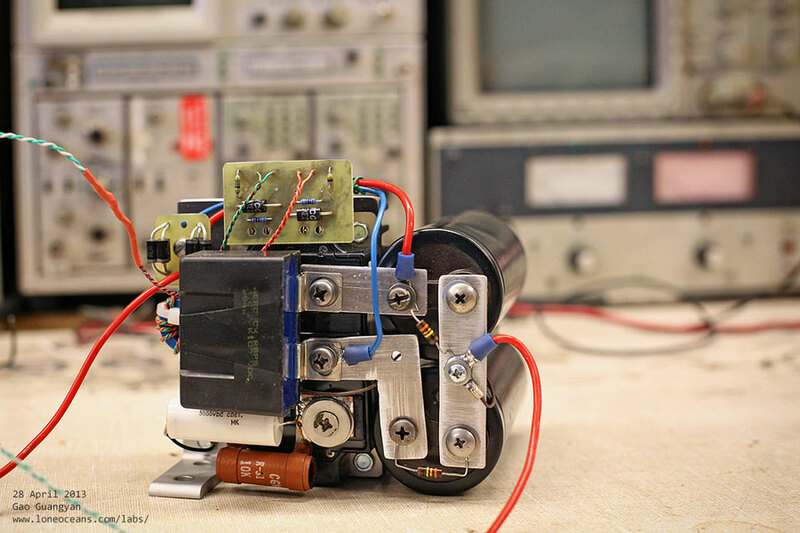 In DRSSTC 2, a small current transformer senses the primary current, and allows the drive circuit to determine the polarity. Using this information, the drive can then switch the bridge appropriately. Of course, it is important to know the correct polarity of the bridge, otherwise the bridge will work to oppose the resonance. When all this works well, we have more and more energy added to the primary, and the current gets bigger and bigger! As this happens, the primary coil generates a strong oscillating magnetic field around the secondary coil. Through induction, energy is transferred to the secondary coil via magnetic field coupling. For maximum power transfer, we try to make sure that these two resonant frequencies match. Eventually, the secondary accumulates enough energy to charge its capacitor (the toroid), to a high voltage. 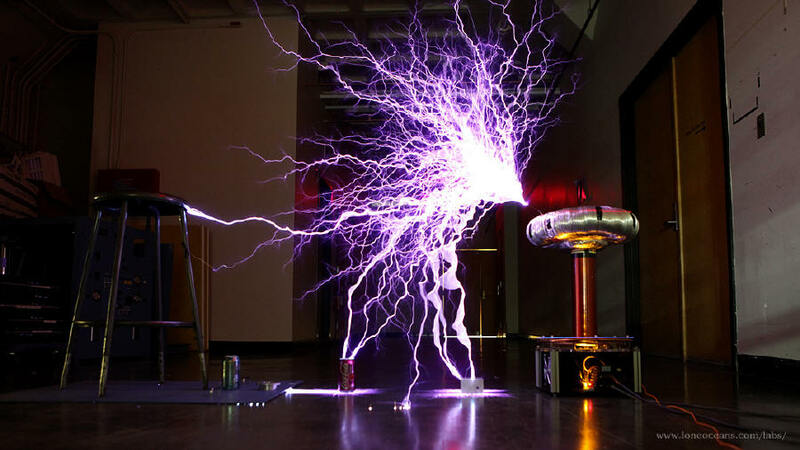 When the voltage gets high enough, an electrical streamer/arc forms. When this happens the Q of the circuit (ability to store energy) drops, as energy is dissipated into the streamer. This is exactly want we want, since it makes the streamer longer and brighter. In practice, the streamer length grows for the next 2 to 4 RF cycles, and does not seem to get any longer. 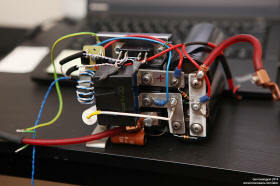 At this point, we have successfully obtained our goal of making a big nice spark, and we can turn off the circuit. Ideally, all the energy left in the primary should be transferred to the secondary - this can be usually observed in the primary current which drops drastically when a large streamer forms. However, if there is any energy left, the anti-parallel diodes in the IGBT recycles the leftover energy into the main bus capacitors as the current rings down. - Be a great learning experience as my first "brick-coil"
In DRSSTC 1, I used TO-247 packaged 60N65 IGBTs, which were nice, but pushing any more performance out of 60A IGBTs would be challenging. The workplace I was building my coil in, MITERS, had a bunch of Powerex / Mitsubishi CM200 transistors lying around. These are very nice 'brick' transistors (so named for their large shape and size), good for 200A continuous, 400A peak rated, and come in a half bridge configuration per module. My original plan was to build a full-bridge of Toshiba 150A 600V half-brick modules, but one of them turned out to be damaged (oh well... ebay! 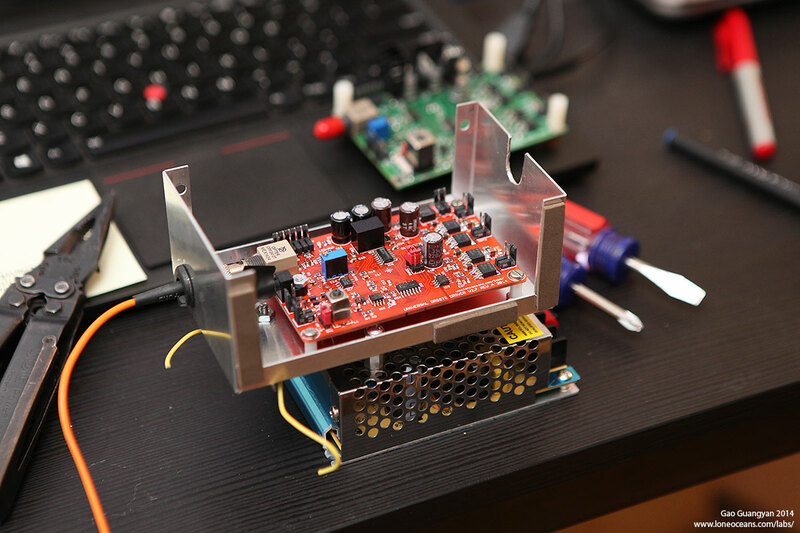 ), so the project took an abrupt change and was modified to run a half-bridge, but at twice the original bus voltage via a voltage doubler. The goal was to design the coil to run off 120 to 240VAC, with a maximum bus voltage of 678VDC, safely within the margins of the 1200V IGBT. However, it is important to give the IGBTs a large safety margin, due to stray inductance which can cause severe voltage spikes during switching. 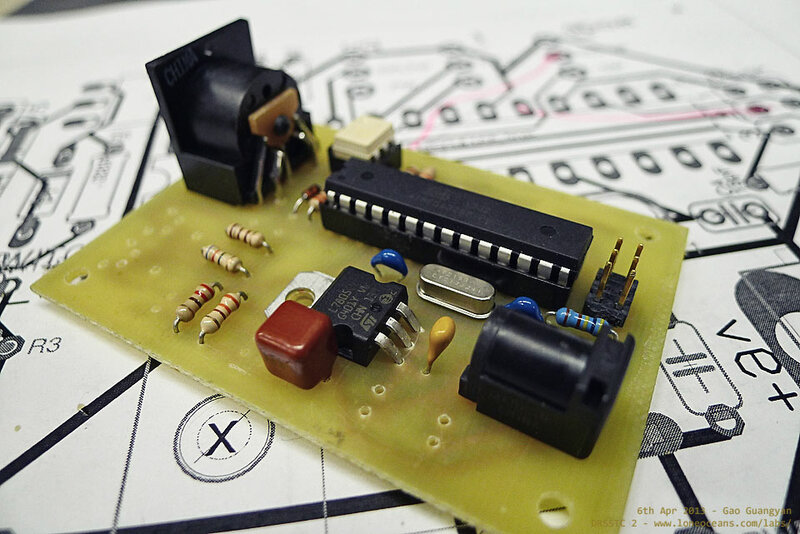 Therefore, I designed the coil to have a low a primary bus inductance by keeping the bus capacitors close to the IGBTs and added a nice snubber capacitor specifically designed for this purpose. 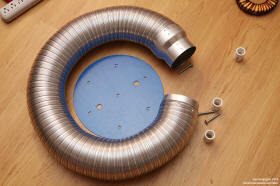 The goal for this project was to make a very impressive coil; i.e. 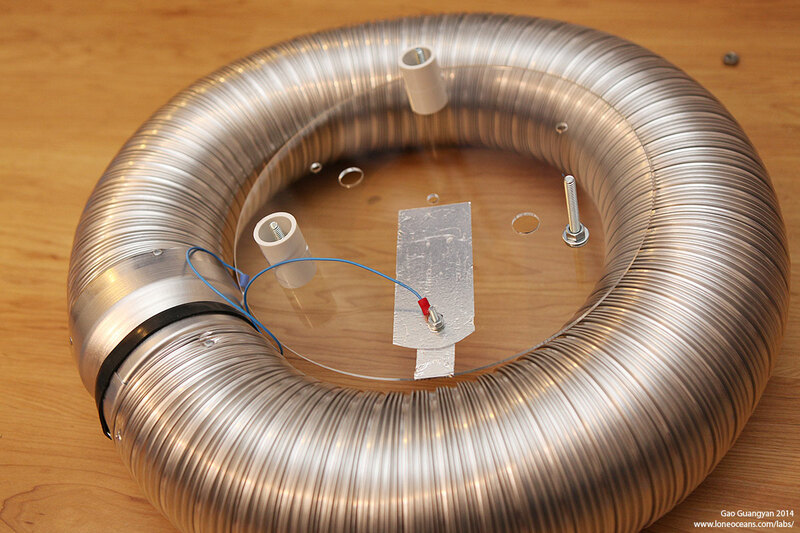 a coil with huge output for its size. 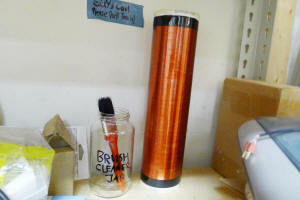 Also, I wanted a coil that was easily transportable. Therefore, I designed the coil to have a footprint of just about a square foot, with a secondary length of around 13 inches. The output goal would be to be at least 4 feet, and if possible 5 feet, which would outperform my large ARSG Tesla Coil 2. Because I was using relatively large 'brick' IGBTs which do not respond well to fast switching, I decided to design the coil with a sub-120kHz frequency goal (turned out to be around 108kHz). In addition, I decided to use a modified driver originally designed by Steve Ward, which uses Phase Lead for ZCS and had over current detection (OCD) built in. Phase Lead works by adding a delay to the switching (tuned by a variable inductor), which switches the bridge slightly before the current inverts, from the second cycle onward. This needs to be tuned by hooking up the primary to an oscilloscope. OCD measure the voltage from the current transformer (across a resistor), and shuts off the driver when it crosses a threshold voltage via a comparator. I decided to set the OCD to 500Apk, which should hopefully give me reliable performance from my IGBTs (which are known to be able to handle 2-3x their current rating in Tesla Coil use). OCD also protects the transistors in the event of strong ground-strikes (increases current flow greatly). I later replaced this with a UD2.7. 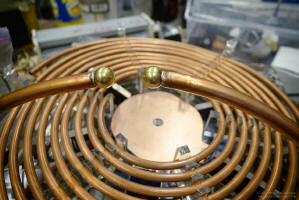 Having made many secondary coils now, the construction of this one was relatively straightforward. I used a standard 3" PVC pipe (actual outer diameter of 3.5") cut to about 14 inches in length, and machined two plastic end caps for it on the lathe. These were carefully threaded to accept 3 nylon screws each to hold it in place. The middles were then threaded with 10-24 threads to allow easy connection to the toroid and box. About two thousand turns of red AWG 34 enameled copper wire (from ebay) was wound on the coil. This took a surprisingly long time of almost 4 to 5 hours due to the extremely thin AWG34 wire. Ideally I would wind a larger secondary coil with thicker wire, but the idea for DRSSTC 2 was to make a compact coil, whilst keeping the secondary frequency as low as possible. The ends were secured with black vinyl tape. The coil was then carefully covered with four thin layers of Polyurethane varnish, allowing each thin coat to dry before the next was applied for a beautiful finish. Originally I had calculated about 2050 turns would fit in the 13" long secondary coil and this would achieve my 100kHz operating frequency with a 4 x 18" toroid. But In real life, because AWG34 is so thin (6.3mil thick, or 6.3 thousandths of an inch), and based on my experience that insulation thickness is about 0.4mil each side, I would more realistically be getting 1855 turns or so, dropping the frequency. A catch here for young players! I knew I wanted the coil to be housed in an elegant, beautiful yet strong and easily constructed box. 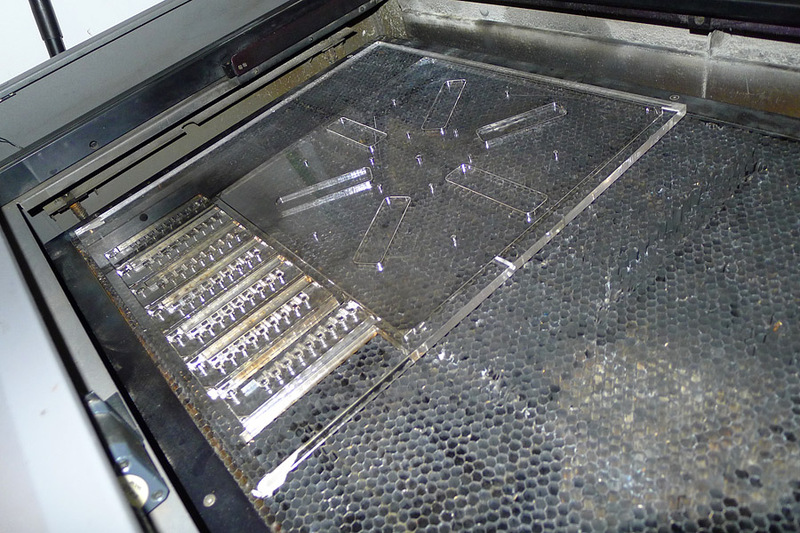 For this, I turned to technology and employed the help of a CNC Laser Cutter to get my box components precisely cut in clear Acrylic. The pieces were quickly designed on paper, sketched out in Adobe Illustrator and sent to print on the laser printer to cut in clear and smoke-black acrylic. The sides are held together via 80/20 aluminium square stock, resulting in a very nice, strong box. In addition, the primary supports were laser-cut and allowed the 1/4" copper tubing I was using to be simply press-fitted in. This resulted in a product that not only took a fraction of the time build and assemble than my previous methods, but also looks beautiful. 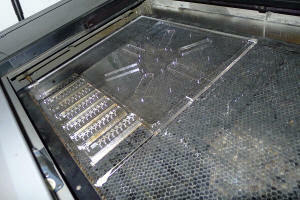 Hooray for technology and CNC tools! In retrospect while everything fit super well in the end in the 1 x 1 square foot footprint, I would probably have done better with a slightly more generously sized box to make my life easier :-). 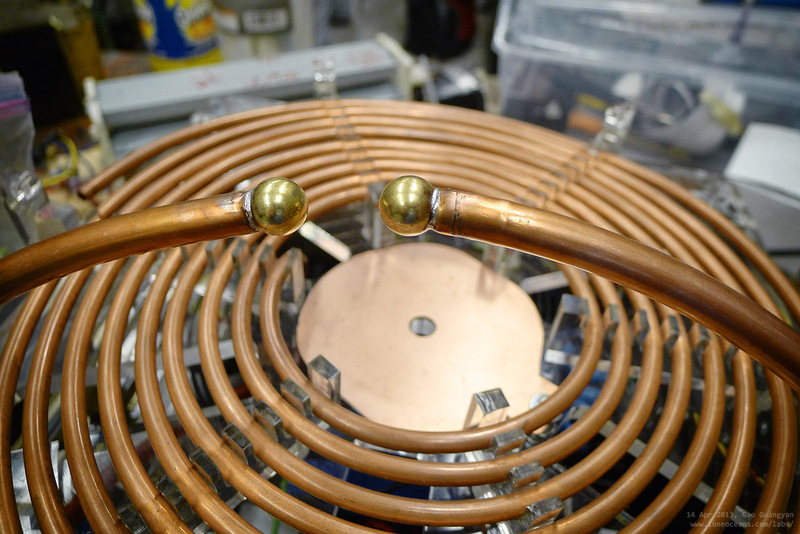 For the strike ring, I used a loop of 3/8" copper tubing which was attached around the primary. The break in the loop prevents eddy currents from being induced causing unwanted losses (afterall the primary coil is basically a big induction heater when in operation!) The ends are terminated by spherical brass knobs soldered into place, just to look fancy. Also note the grounding plane at the middle of the primary coil. Slots were later cut into the copper to reduce eddy-current heating during operation - the plate was getting hot enough to start melting both the acrylic base and the PVC coil even during short runs! The interrupter as described above sends a 1 bit signal to the Tesla coil driver. Basically, it turns an LED on or off, and sends this via fiber optic to the driver. I developed the interrupter based on Daniel's and Bayley's open-source MIDI controller. I also added an additional output which allows the use of both 1mm plastic fiber output or standard ST Multimode fiber output. The interrupter is simply based on an Atmel 328p Microprocessor and allows adjustable frequency, pulse width from 0 to 135us and also accepts a standard MIDI input with up to two notes of polyphony. All this is powered via a 9V battery and housed inside an aluminium box for shielding. This is also the interrupter that runs my DRSSTC 1. This was later updated with a completely new MIDI controller of my design (late 2013) featuring more control and multiple coil capability. 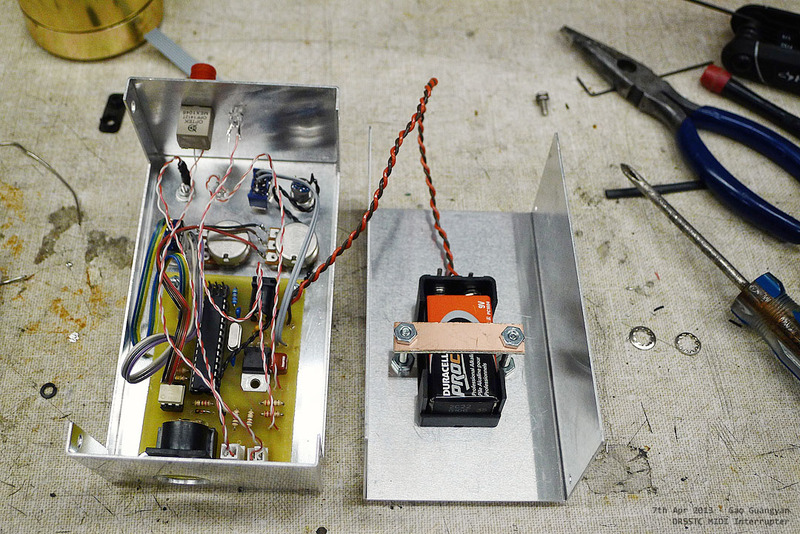 My original design was centered around two IGBT half-brick modules I bought on Ebay. These were the Toshiba MG150J2YS50 IGBTs, good for 150A 600V each, and I had planned to use them in a full-bridge configuration with a single 2300uF 450V capacitor. 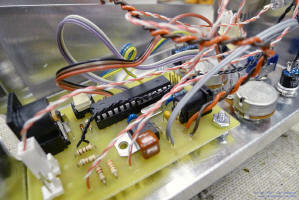 These were assembled on a one-piece heat sink with an integrated bridge rectifier, copper bus-bars and wiring. This turned out to be very elegant and beautiful, and fit perfectly into my box. 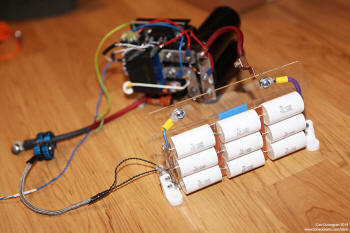 In fact, initial tests of the bridge at 80V seemed to work half the time, but produced very unusual results otherwise. I later found out that one of the IGBTs in the half-bridge wasn't working properly and was in fact, half dead! Therefore I had to scrap the bridge and build something else. This nice looking bridge is currently awaiting repairs with a new set of half-sized IGBTs. Newly completed Half-Bridge which drives the Tesla Coil. This bridge uses a single 200A 1200V half-bridge module, with a voltage doubler from the two 1875uF 350V capacitors. Note the integrator rectifier, snubber capacitor, onboard Gate-Drive Transformer as well as 1.5KE33 TVS diodes on the gates and drive resistors. A 10kR 7W bleeder resistor is added across the output of the inverter to bleed residual MMC voltage; and a 68nF 3kV capacitor is wired (incorrectly in this photo) across ground and the negative bus rail for primary strike protection. The small PCB that holds the TVS and diodes was later removed for more clearance in the crowded box. Some parts of this bridge were slightly tweaked (see photos below). This CM200 IGBT comes with an integrated RTC module, with limits the current and turns off the IGBT when it exceeds 400A. In order to make the IGBT suitable for DRSSTC use, I opened up the IGBT and carefully cut the wires to the RTC, effectively disabling it. You can see my DRSSTC 3 page where I describe this in detail. With the discovery of the damaged 150A Toshiba IGBTs, I quickly built a new bridge. The modular design allowed me to quickly get the coil up and running again. 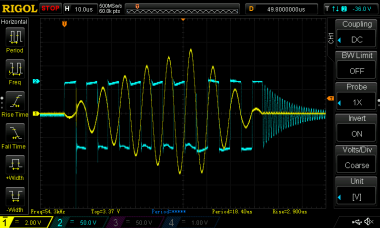 Using an oscilloscope, I was able to adjust the phase-lead for perfect compensation, and made sure the primary current and bridge voltage was what I was expecting. Performance of the coil before tuning, at 120VAC in (122kHz primary). Performance of the coil at 120VAC in on 29th April 2013 (38 inches) after tuning with an oscilloscope with simulated streamer loading. It was time for the first full power test at 120VAC input (340V on the bus). Initial runs on 27th April proved to be somewhat disappointing. I suspected that tuning might be a problem, so I went back to the lab and tuned my primary to be in resonance with the secondary (with a 4-foot wire attached to simulate streamer loading). This brought my resonant frequency to around 108kHz. 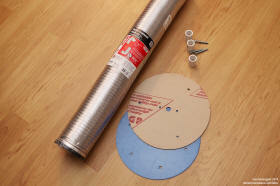 Adjusting the primary tap by half a turn made a huge difference, with the coil achieving a 38" output with 120VAC in! The coil performed spectacularly but it really wants 240V in. Notice that I removed the small toroid because it didn't seem to make any difference in the resonant frequency of the secondary. Just for recording purposes, here are my measurements I took when tuning the coil in this configuration. Secondary frequency with the 17 x 4" Toroid measured to be 122kHz. Attaching a 4 foot wire to it dropped the frequency to 106kHz. The primary coil at turn 7.9 measured out to be 112khz and at turn 8.8 was 101kHz. In the first photo above (before turning), I was running at turn ~8, giving me 112khz, As you can see, I had nice sparks but they were in the ballpark of around 2 to 2.5 feet. I tried at turn 7, making the resonant frequency more like 120kHz, this time with poor results, about 2 feet. Then I tried turn 9, again with poor sparks around 2 to 2.5 feet. Then I tried turn ~8.6 and this time the results were spectacular, and I could really see an increase in spark length. At this turn, the primary frequency should be around 106kHz, which corresponds well with the secondary frequency with a 4 foot wire attached. The runs were conducted at 140VAC in, and OCD at 450A was not tripped. I also found that a pulse width of ~135us produced good results. 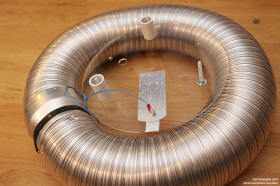 This coil was really designed to be run at higher voltages such as 240VAC. I was unable to get a powerful enough step-up transformer, so I did a quick test running this coil off 2 poles of 208VAC (from 3 phase). This time, the coil made full length sparks at 200bps, ~100us and 500Apk. 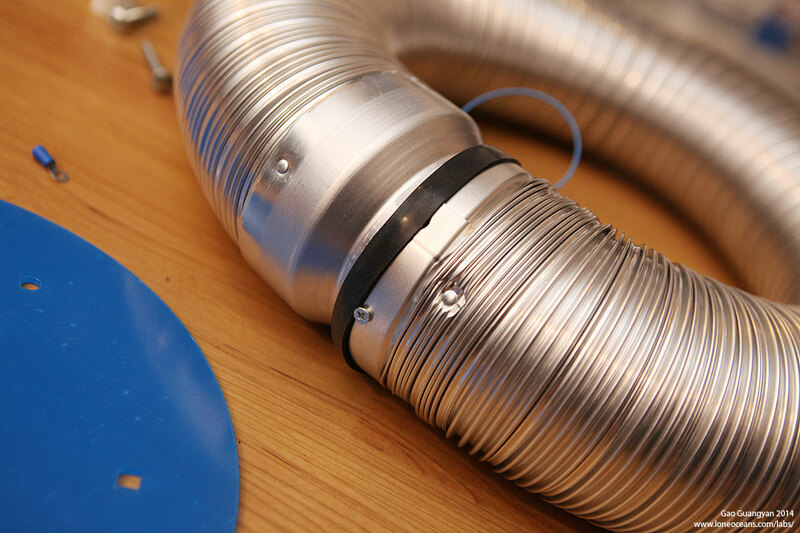 The results are spectacular, with arc lengths of around 5 feet, which is very impressive for a coil this size! :) At this point, the coil has already exceeded all my expectations, and I'm glad that physics, math, simulations and good construction had paid off. 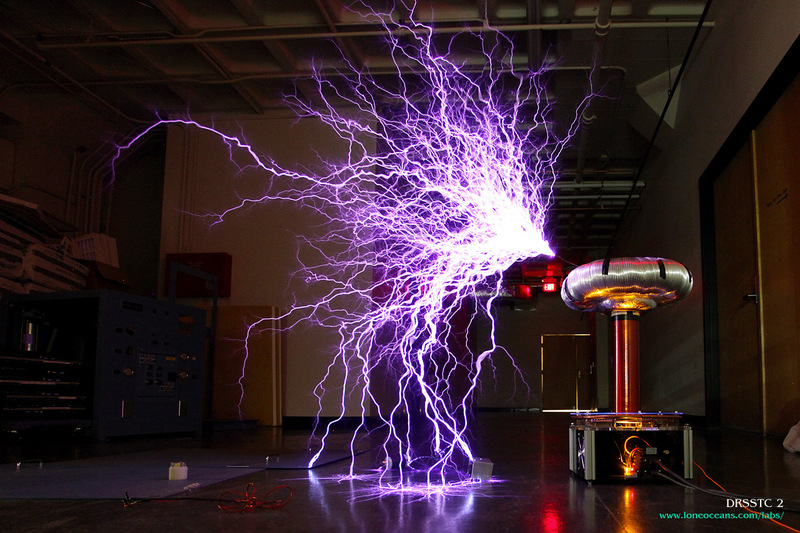 Even with modest pulse-widths of around 100us, the lab I was running was just at the very limit of containing the spectacular output of the Tesla Coil. OCD ws set at 525A. Much more results to come after I obtain a suitable step-up transformer. Video of DRSSTC 2 in a short test run, 208VAC in. 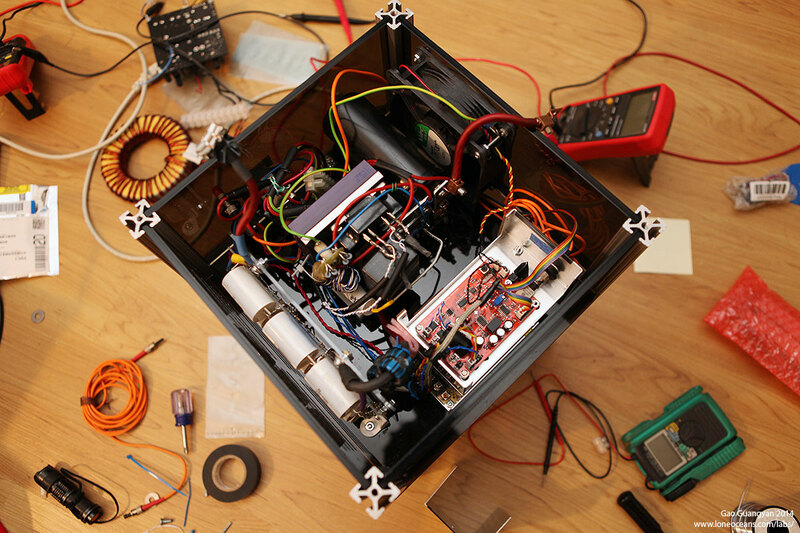 Right now, the goal is to finalize the Tesla Coil by improving wiring and component positioning (stuff is very messy inside after shifting to a different bridge design), improving grounding, and perhaps adding some lights and a new spun toroid to the Tesla Coil. I hope the end product will be a powerful, reliable Tesla Coil which I will be able to use for future demos. Definitely more to come in the coming months (after summer!). I managed to finally find a 240V step-up transformer to run the coil! The results are very impressive and the coil is basically limited by its secondary height, with sparks reaching 5 feet making it very difficult to contain secondary to ground-ring strikes! On 9th November I set it up for a test run with the new 2kVA step-up variac. The maximum input voltage was set just around 200VAC and pulse-width set to just over 100us. I found that with a single toroid, a lot of sparks tended to hit the ground strike ring. Hence I ran the coil with a second smaller toroid below just to lift up the big toroid higher from the primary. This photo shows DRSSTC 2 making sparks happily - check out the nice banjo effect on the right side. I actually ran into an interesting phenomenon with the driver locking up forcing the coil to go semi-CW. This was due to the fact that I had got ahead of myself and made a grounding cable (which is connected to the grounded box the driver was in), which was initially connected to a large metal counterpoise on the floor (but not really grounded!). The OCD kicked in and prevented the coil from blowing up, but it was an interesting observation. My guess is that the large counterpoise acted as a large antenna forcing the 'ground' to have significant induced noise. The results are spectacular and the coil runs great! 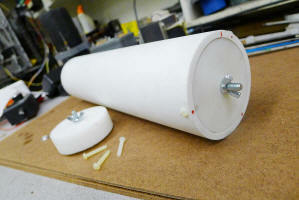 Here DRSSTC 2 makes what seems like a 53" (134cm) monster spark to air. This is 4.077x the secondary length! Finally, I tried to set up the coil to make long sparks for a spark record. 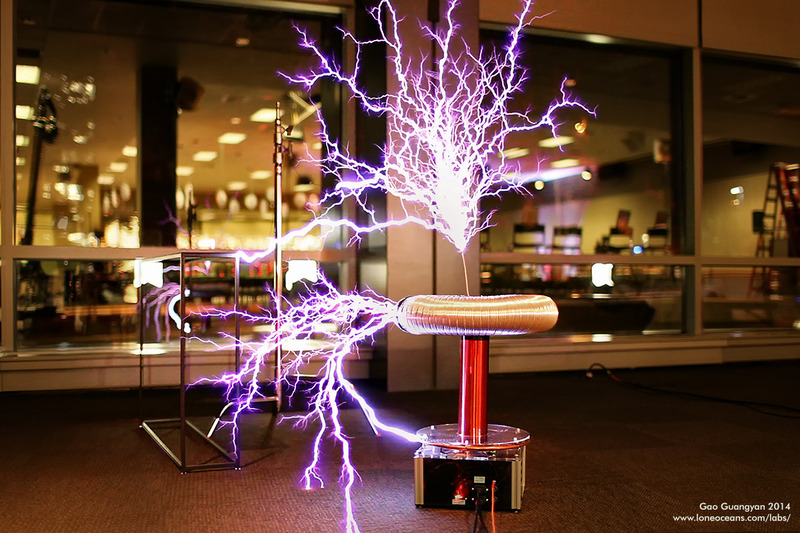 This photo shows the coil making 48" sparks to the chair, but the maximum recorded was 51" to ground with 525A OCD. Anything more than that becomes a bit tricky due to the sparks wanting to hit the floor instead. 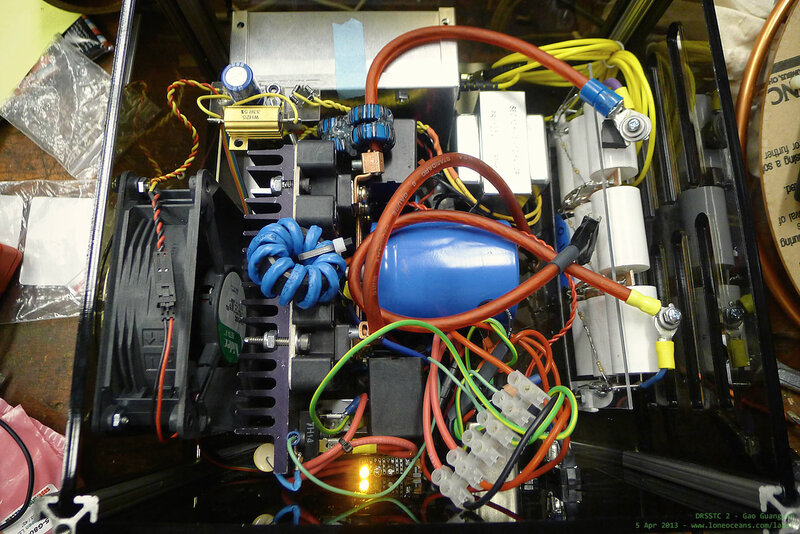 The next step is to put a breakout point at the top of the toroid and try to make it hit a ground plane suspended from the ceiling, as well as using a beefier power supply (I suspect the 2kVA transformer was maxing out limiting power to the coil), as well as running at a higher input voltage. I had been working on other projects for a while and DRSSTC 2 did not see much action in 2014. However, having moved to a new location, I wanted to try to get the coil back up and running (and to see if it survived a cross country trip in a post box). There were a few small refinements I wanted to do for the coil but nothing major. First, the original junky-looking toroid was poorly made and had sharp points all over, so I wanted to make a new toroid and slightly increasing the size to further reduce the resonant frequency. 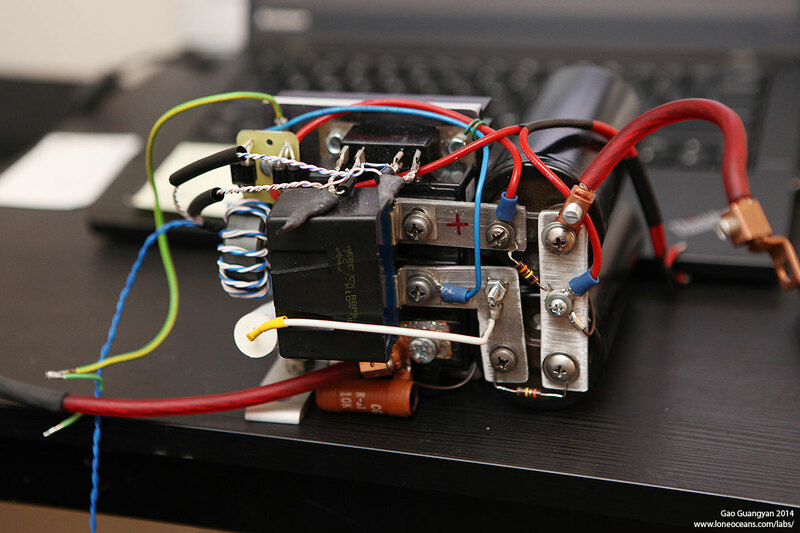 In addition, the coil previously used a single 25.2V transformer for the fan and logic power and a modified version of the UD2 driver. This caused some thermal issues with the driver getting very warm, as well as the fact that it was limited to 120V operation on the logic-side. So I took the opportunity to do some small changes to the coil. I made a new toroid using the proven aluminium-ducting method I used in my DRSSTC 3. With the new toroid, the new secondary resonant frequency dropped slightly from 122 to 117.4kHz. Attaching a 2.5 foot simulated wire dropped it to 109.6kHz, and a 4 foot wire to 103.5kHz (down from 106kHz). The simulated optimal tuning point is at turn 7.6 (116kHz), though a ~10% de-tuning to the existing turn 8.6 would probably yield good results. 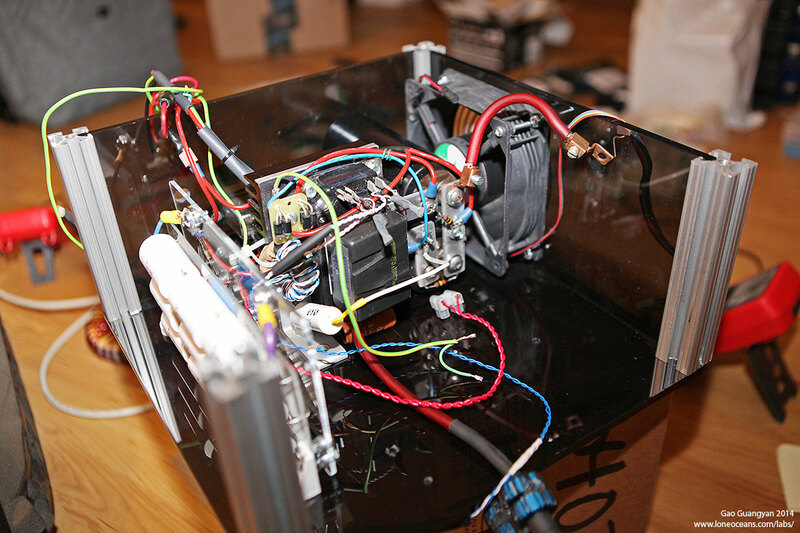 As mentioned, I wanted to swap out the clunky 25.2VAC transformer powering the fan and the driver. This was causing problems because the transformer had an output voltage closer to 28VAC or so. The previous UD2 I used also ran very hot (regulators have to drop the voltage down from 39VDC) so I replaced the entire driver with my UD2.7 rev A driver board. I mounted this over a cheap $8 China 24V 2A power supply I got from eBay, which accepts 110 - 240VAC input. I also didn't want to run the 24V Nidec Beta V fan at full power (too noisy), so I added a 25W 33R resistor in series to the fan. The entire setup is much tidier and now runs much cooler, so hopefully this will bode well for reliability. The OCD was set at 450A. Not much was changed from the original CM200 half bridge. You might note some small differences from the original photograph, but otherwise nothing has changed. Once the few small changes were done, the parts were then assembled back into its small case and everything fits well. One new feature was that I added an ST-ST fiber optic coupler on the front panel of the box, so the input ST fiber can be connected directly at the front of the box. This makes setup much tidier as well since everything is integrated. Here are the waveforms of the primary current (yellow) and bridge output (cyan), showing perfect switching and very little switching spikes :). I tuned this up to about 105A or so. Good to go! So did the coil work in the end? Yes it does and continues to run as spectacularly as before! I found it to be very reliable running at about 180 - 200VAC input producing 3 to 4 feet of spark at sub 100us pulse widths very reliably. The coil was displayed at a science fair and ran dozens of times with its musical display of lighting from a 208V power supply with voltage adjusted via a 5kVA variac. I would like to thank the following people, for this coil would not have been completed without them.